Wood handle? Check. Soft nylon bristles? Check. You’ll love this brush! 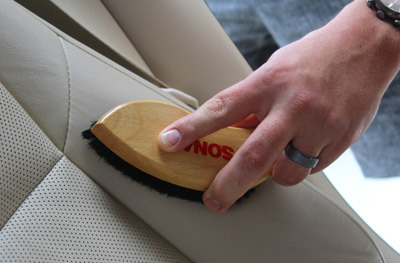 Use the ergonomically designed SONAX Textile & Leather Brush for all your interior cleaning needs! This brush is surprisingly comfortable to grip so your hands won’t feel fatigued after a short period of time. Pair the SONAX Textile & Leather Brush with one of many SONAX interior cleaners to create a spotless, showroom clean interior! The soft bristles are safe for delicate interior surfaces, including alcantara! If you spend any time browsing our site, you’re well aware that we have a brush for leather, carpet, fabric and vinyl. Why purchase more than one brush when the SONAX Textile & Leather Brush does it all?! That was our reasoning behind bringing in this uniquely designed, exquisitely crafted (wood handle!) brush because it makes detailing interiors SIMPLE. This brush allows you to have your cake and eat it, too! Use the SONAX Textile & Leather Brush for the dry and wet cleaning of textiles and for the thorough and gentle cleaning of smooth leather surfaces. Do you have a performance car with grippy alcantara seats? Pair this brush with SONAX Alcantara Cleaner and your seats will look, feel and smell brand new again! Simplify your detailing regime by picking up the SONAX Textile & Leather Brush. 6 inches long by 2 inches wide. I bought this brush to help work in the SONAX Alcantara cleaner. Well it is a great brush, really made the material feel new again. Quality deep clean leather brush. I purchased this brush to use on my personal vehicles. This is a quality brush. Not too stiff. Not too soft. Works perfect for the sensitive materials on the newer vehicles like mine!!! Canâ€™t go wrong with sonax. Always quality products. Also great fast service from Autogeek as always.